The A3 problem-solving tool is a bright example of how problems should be treated in order to be eliminated efficiently. Scroll down to learn more about A3 and how to use it. A great part of our daily work routine is actually related to solving problems. Either small or big, problems are an inevitable part of our workday. However, if you decide to act fast and remove a problem as swiftly as possible, you may face the same issue over and over again. Instead of fighting only the symptoms, you need to dig deeper and discover the root cause. By doing so, you will be able to protect the work process from recurring problems. A3 problem-solving tool is a bright example of how problems should be treated in order to be eliminated efficiently. Based on some simple steps and ideas, the model gives directions on how to deal with problem-solving issues through simple structuring, good collaboration, and active communication. The A3 report is one of the many Lean management tools, developed as part of the Toyota Production System (TPS). There isn’t a single inventor of the A3 reports. In fact, Isao Kato (former manager at Toyota) describes it as ? hybrid between the PDCA cycle and Toyota’s philosophy to make things visible. There is also a legend that Taiichi Ohno often refused to read further than the first page of any written report. This is why the A3 is a one-page report. The name A3 simply comes from the European A3 paper size corresponding to 11-inches by 17-inches or 29.7cm x 42cm. The A3 thinking played a major role in Toyota’s commercial success. Consequently, it became a widespread tool, now used in various industries. Let’s explore the A3 problem-solving tool in details. Actually, A3 is just a single report that will not help you solve problems like a magic wand. It is much more important for all involved parties to be dedicated to the process itself and communicate actively. The owner is responsible for managing the process and maintaining the document. On the other hand, the owner needs to be advised and supervised by a mentor, who is experienced in problem-solving. The mentor’s role is to give directions and provoke the problem owner to find the solution, but not to give answers and propositions. Last but not least, there are the responders or stakeholders. They are the third party, which is directly interested by the final results of the A3 project. Here is the challenge. Usually, there is a wide variety of stakeholders involved.The problem owner needs to have access to all of them if needed. However, we all know that in organizations with a strict hierarchy, it is a bit difficult to reach the higher management. This is why the whole organization should be familiar with the concept of lean thinking and be prepared to assists at any time. Sometimes this is challenging, but it can show how flexible an organization really is. At the end of the day, the active communication between all parties involved is crucial for the success of any A3 project. A3 is a lean thinking process where the problem owner should go through the different steps of the model until there is a proper solution to be implemented. The owner needs to communicate actively with his colleagues and the mentor of the project. Let’s go through the different steps of the process. The first step is to clarify the problem and briefly describe it. This is a starting point where the owner can add context and support the next steps. Before a problem can be addressed properly, the problem owner needs to describe the current situation in the area where the issue appears. At this stage, you can map the different processes that exist around the problem area. It will allow you to see the bigger picture and identify the root cause. After the current situation is clear you need to set goals. Keep in mind that at this stage you need to take into consideration that you don’t have the full picture. So after you go through the remaining steps until “effect confirmation” you can come back to this step and add more details to the initial goals. If you try to fight the problem immediately, you will only treat the symptoms. However, this is only the surface, while the root cause remains untouched. This way a problem may appear regularly in bigger proportions. Therefore, once you have a good understanding of how the processes work and what the initial goal is, you need to figure out the root cause of the problem. For this purpose, you can use different techniques such as the 5 whys. Once you are familiar with the root cause you may start offering solutions. From here you can go back to the initial goal and add more details. In all cases, the countermeasures should lead to a clear understanding of how the initial goal will be achieved. After setting the countermeasures you have to present an implementation plan that includes a list of the actions that will be applied to get the countermeasures in place. It is also helpful to assign responsible individuals for each task and a due date. The last step is crucial for establishing a culture of continuous improvement. It is very important to measure the actual results and confirm the effect of your countermeasures. Whether there are positive or negative results you need to take actions. If the actual results differ from the predicted ones, you should modify the plan, reimplement it, and follow-up. If there is a positive effect, you should communicate improvements to the rest of the organization and ultimately make them a standard. The A3 model is consistent and it encourages mentoring and overall collaboration. Furthermore, it promotes cross-organizational sharing of information and encourages learning and continuous improvement on every organizational level. Also, the model encourages commitment to common goals and strengthen the levels of responsibility. 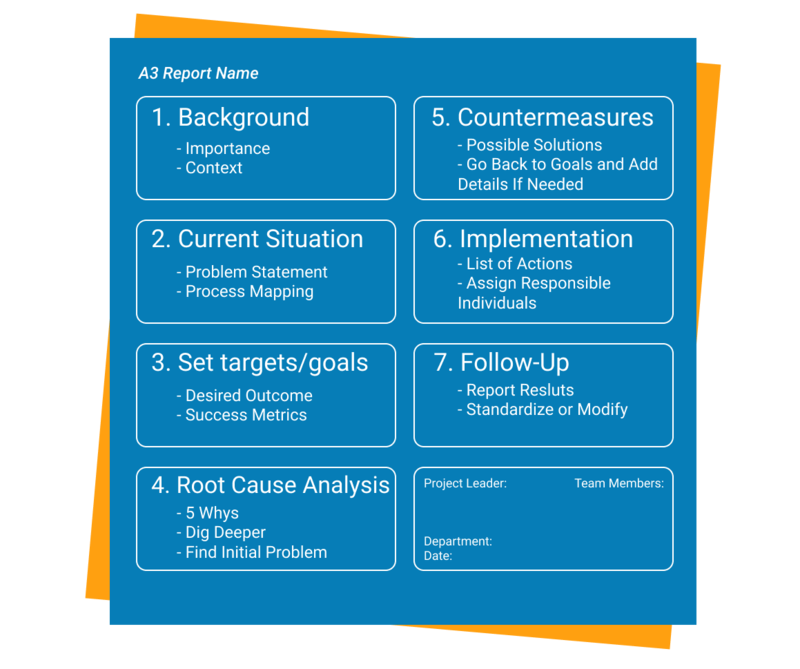 Last but not least, you can use an A3 report not only for problem-solving, but also for proposing improvements, reporting, coaching, and others. It is simple and promotes mentoring and collaboration. It fights the root cause, but not only the symptoms. It encourages cross-organizational knowledge sharing.